First screen you will get lists current users. You should see the account Email that you registered with. Click "Edit" to change any current users information or "Delete" to delete that user. NEVER DELETE THE MAIN ADMIN ACCOUNT! At the top of the page you'll see buttons "Add New User" and "Reassign User". Reassign User is used when you have an employee leave or such and need to reassign all of his WO's to someone else. To add a user click "Add New User". Fill in the information for the new user. Name, Email Address, and Permission Level are required. 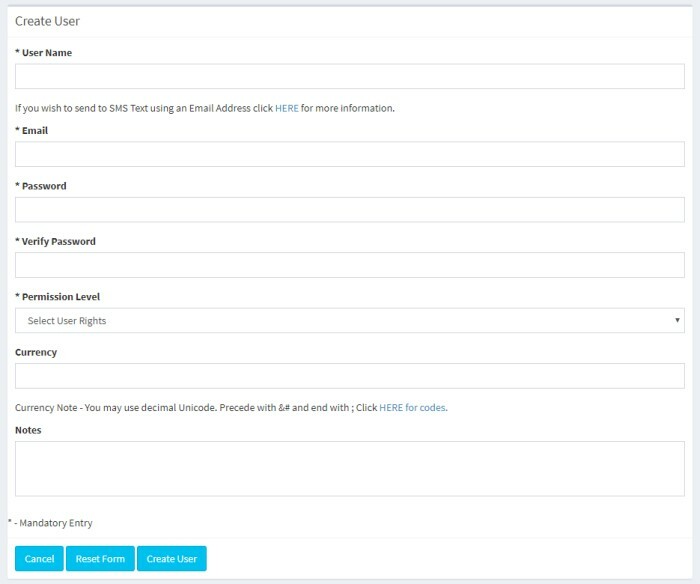 You can select the users permissions by scrolling down the "Permission Level" selection menu. Admin - All rights. Only Admins can delete items from the database. Tech - Can create work orders, edit work orders, close work orders, manage parts and manage equipment. Can create PM's. Techs cannot delete anything. Dispatch - Can create work orders, edit work orders. No Delete or Close work order abilities. No Part, Equipment or PM abilities. Once setup, your users will be able to login using their Email address and Password. Only Admins have access to the Users Screen and can change passwords/Email.